Pens. We all use them, and even in a world that is becoming evermore reliant on computers, iPad’s, iPhone’s, the web and email, to my mind, receiving something that is hand written is still held in a higher regard than from any of the forementioned. And quite rightly so. There is still nothing nicer than an invite or a letter which has an element of ‘pen to paper’. It just feels more personal. Don’t get me wrong, I’m a huge fan of technology and all that it delivers. I have a computer, iPad, iPhone and I seem to be ever so slightly obsessed with social media. And like you I would guess, there isn’t a day that goes by that I’m not sending emails, typing letters, in fact just tapping away on a keyboard. So when it comes to writing, are we entering a time when pens become evermore unimportant? Ancient Indians were the first to use the pen. According to ancient text the earliest of pens made in India used bird feathers, bamboo sticks, etc. The old literature of Puranas, Ramayana and Mahabharta used this kind of pen roughly 500 BC. Ancient Egyptians developed writing on papyrus scrolls when scribes used thin reed brushes or reed pens from the Juncus Maritimus or sea rush. Reed pens continued to be used until the Middle Ages although they were slowly replaced by quills from about the 7th century. The reed pen, generally made from bamboo, is still used in some parts of Pakistan by young students and is used to write on small boards made of timber. The Quill pen was used in Judea to write some of the Dead Sea Scrolls which date back to around 100 BC. The scrolls were written in Hebrew dialects with bird feathers or quills. After the fall of the Roman Empire, Europeans had difficulty in obtaining reeds and began to use quills. Quill pens were still widely used in the 18th century, and were used to write and sign the Constitution of the United States in 1787. So why should you have a good pen? Firstly, and most importantly, a good pen is a joy to write with. When you find one that suits your style of writing, writing becomes a pleasure. It’s comfortable and dependable in equal measure. But as funny as it sounds, having a good pen is a bit of a status symbol. Accessories play an important role in reinforcing ‘brand you’, and having a good pen in your inside pocket is an extention of your efforts in other directions. Rest assured, people notice. Rather like a good quality business card. This dispenses viscous oil-based ink by rolling a small hard sphere, usually 0.7–1.2 mm and made of brass, steel or tungsten carbide. The ink dries almost immediately on contact with paper. This type of pen is generally inexpensive and reliable. It has replaced the fountain pen as the most popular tool for everyday writing. One common type of ballpoint pen is the erasable pen, invented in the 1980s. This uses water-based liquid ink delivered through a nib. The ink flows from a reservoir through a “feed” to the nib, then through the nib, due to capillary action and gravity. The nib has no moving parts and delivers ink through a thin slit to the writing surface. A pen with a refillable reservoir may have a mechanism, such as a piston, to draw ink from a bottle through the nib, or it may require refilling with an eye dropper. Refillable reservoirs, also known as cartridge converters, are available for some pens designed to use disposable cartridges. This dispenses a water-based liquid or gel ink through a ball tip similar to that of a ballpoint pen. The less-viscous ink is more easily absorbed by paper than oil-based ink, and the pen moves more easily across a writing surface. The rollerball pen was initially designed to combine the convenience of a ballpoint pen with the smooth “wet ink” effect of a fountain pen. Founded by the stationer Claus-Johannes Voss, the banker Alfred Nehemias and the engineer August Eberstein in 1908, the company began as the Simplo Filler Pen company producing up-market pens in the Schanzen district of Hamburg. Their first model was the Rouge Et Noir in 1909 followed in 1910 by the pen that was later to give the company its new name, Montblanc. The first pen (a fountain pen) known as the Meisterstück (English: “Masterpiece,” the name used for export) was produced in 1924. Today Montblanc brand is on other goods besides pens, including watches, jewel, fragrance, leather goods and eyewear. 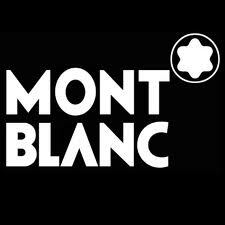 Today Montblanc forms part of the Richemont group. Its sister companies include luxury brands Cartier, Van Cleef & Arpels, Chloé, and Baume et Mercier. Montblanc is owned, through Richmont, by the South African Rupert Family. 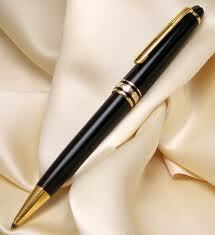 Not to say this is a must, but for me, the pen that I’m never without is my Montblanc Meisterstück Le Grand ballpoint. It’s a classic that with a thick nib (you can choose of course) just glides across the paper. It’s a pleasure to write with. It’s true, we do put pen to paper less than our predecessors did, but when we do write, it is nice to do it in style.